Bandana - This bandana is seriously the cutest summer-y accessory! It comes in 3 colors, and can be worn so many ways. So far, I’ve worn mine as a headband, and tied onto my handbag for a fun pop of color! Crossbody Bag - This bag is right up my alley. I love the roll-top and buckle detail, and can totally picture it with a breezy summer sundress or some cutoffs and a white eyelet top. It’s $25, #yesplease. Classic Tee - Something I should consider adding to my resume: professional white tee shirt collector. I get so much use out of these babies that I can’t help but buy one (or three) every season. This particular version is perfectly relaxed – I got a medium which gives me enough slack to tuck or knot, when appropriate. Cutout Bootie - These boots, which are actually more like an “shootie”, are so perfect for transitioning between seasons. They come in both cognac and ivory and are a perfect dupe of the Free People Royale Flat, which will run you about $160 more than the Target version. I plan on styling mine with everything from boyfriend jeans to maxi dresses. Slides - These slides are the perfect neutral, “throw on” kind of sandal. They’re comfy, go with everything, and are still cool enough to make it look like you tried. Lightweight Sweater - I’ve been wearing this sweater on the reg. The garment has a slightly more open knit and is lightweight, which makes it a perfect summer staple. The split hem makes for an easy front tuck. Button Front Shirt - I’ve been seeing these little short sleeve button downs around, and was surprised at how much I was into them. When I stumbled upon this one for a cool $18 - It was fate. So far, I’ve paired mine with some destroyed skinnies, but can’t wait to style it with cutoffs or knotted over a cami dress. Would also be super cute to size up and wear as a cover-up over a bathing suit! Wrap Front Maxi Dress - Okay, I’m obsessed with this dress, and am so bummed that my local Target hasn’t had my size in stock. The dress is made of a comfy, stretchy jersey-like material and has a super flattering wrap front closure and tie waist. The sweet ditsy floral print gives me total vintage vibes. Neeeeed to pair this with a cropped denim jacket and the booties from above. And, maybe some turquoise accessories. C’mon Glendale Target, help a sister out. Jumpsuit - I’ve been in a jumpsuit state of mind lately. Can’t. Get. Enough. 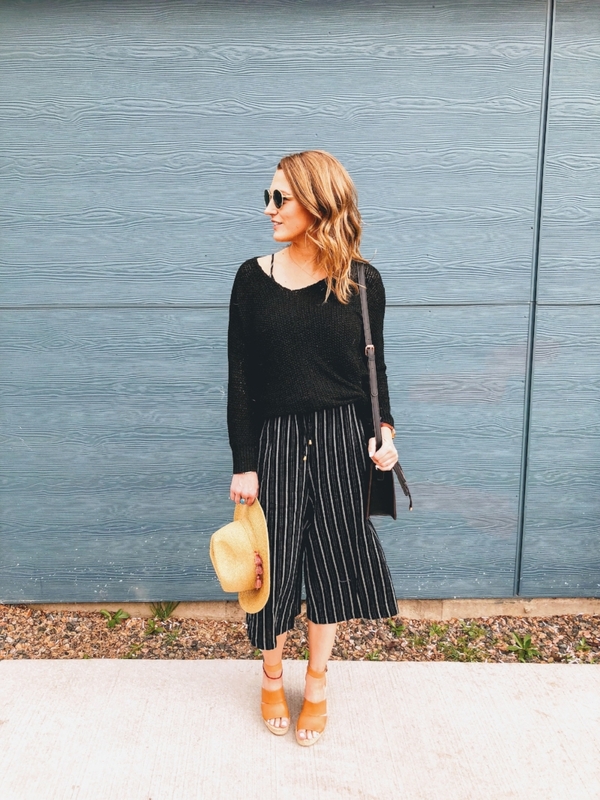 This garment has a wide leg, and simple stripe pattern – The relaxed fit and flattering black color make it easy to wear, and a great place to begin your own jumpsuit journey. 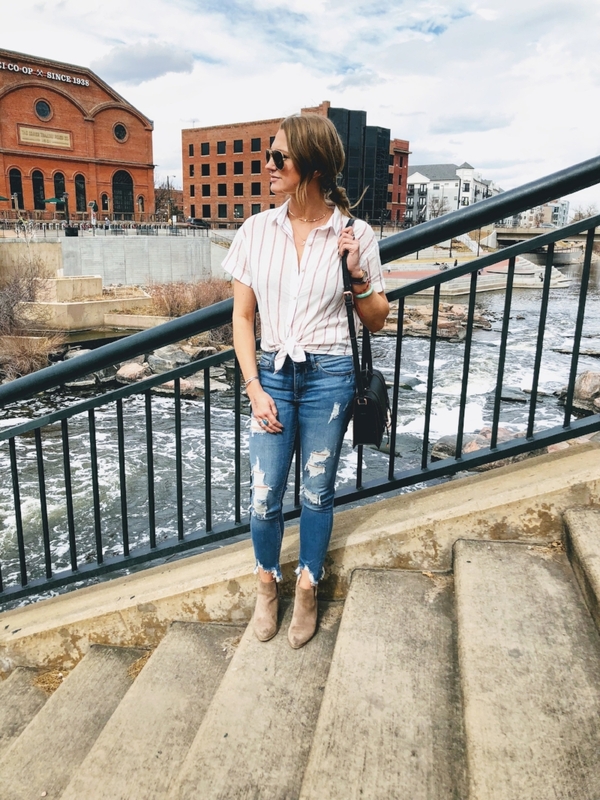 I’ve been layering mine under a sweater for spring, but can’t wait to lose the layers and accessorize with some dainty necklaces and strappy sandals for a casual, but still stylish, summer look. 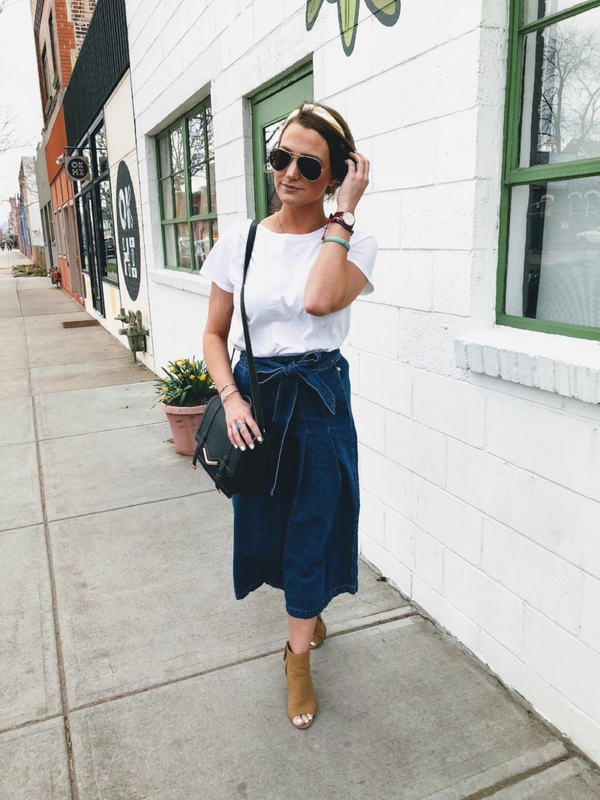 Wide Leg Cropped Jeans - These jeans are so fun! 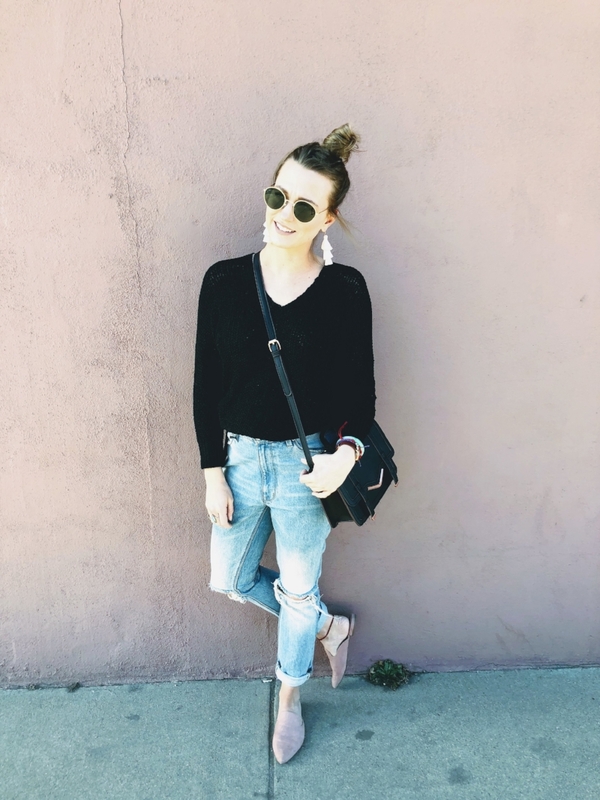 I admittedly was a little nervous about styling and wearing them, but settled on a basic white tee and some booties! I decided it was best to keep it simple and let the pants do the talking, if you know what I mean. These pants would also look amazing with a fitted body suit, or cropped graphic tee.